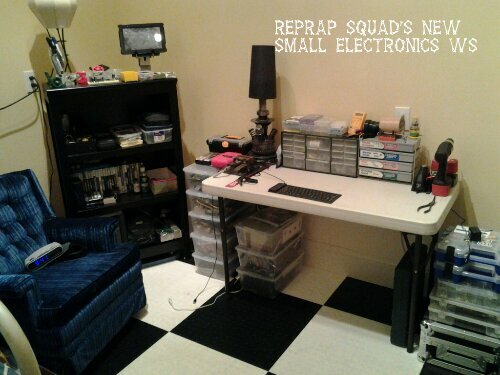 I recently recieved a broken 37″ LCD TV and I used to repair them so it be non working was not an issue. I had more of an issue with where to put it as well as comming up with a functional use. So I decided why not make it into a coffee table. Its about the perfect size and Ive always wanted a coffie table. 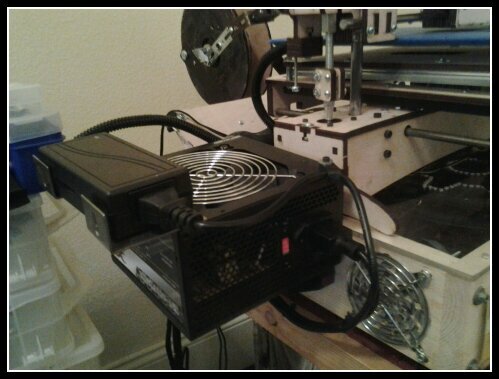 You may say, “well what does this have to do with repraps or Printrbot?” My answer would be, ” Im hooking ip a computer as well.” I have several spare computers that are just sitting and melting away so to speak. Since there are really no DIYs out there and I definatly dont want to spend any money. I will have to be creative and come up with my own. I took one look at my old desk and decided that it would have to do the part. 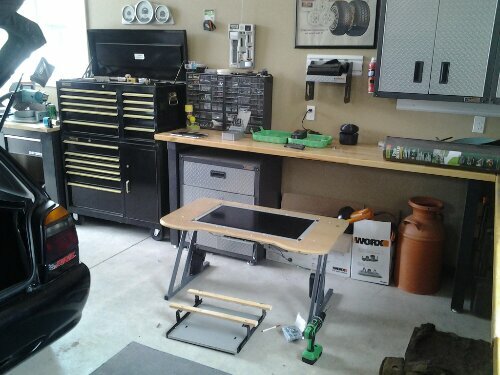 So far I have taken out every nut and bolt to get ready to make some cuts. I would have to cut the legs in half to get it down to coffee table height which was no issue. 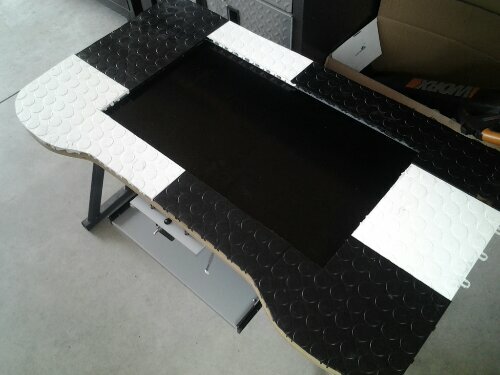 The main problem was the fact that the legs on my desk are in to far and would get it the way. So I will have to figure out new mounts as well. I will update this soon with photos and maybe a DIY on the matter. Update: I’ve made enouph progress to show you some pictures. 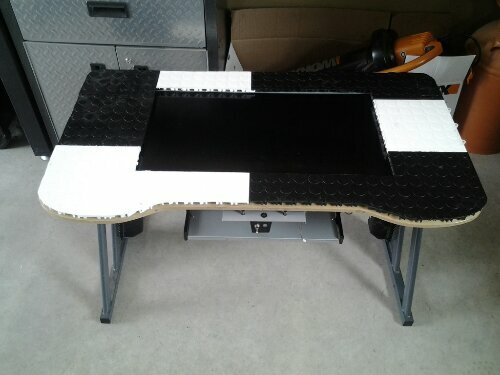 I’m still quite a ways from being done but it’s starting to look like a coffee table. So far I have zero dollars invested. 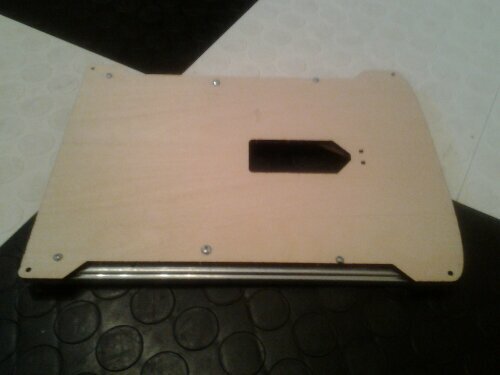 This plastic top will be painted all black and have glass or lexan on top. 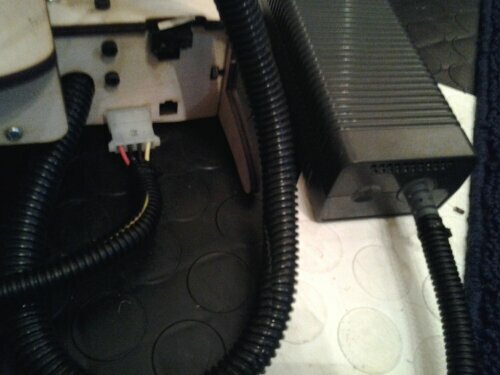 I will be putting a black plastic strip around the outer edge that will keep everything at the same thickness. I was finally able to find a piece of acrylic large enouph to put over the top of the coffee table. The only bad part about using acrylic is the fact that it scratches easily. I need to experiment with different clear coating for protection. I started sanding and cutting down the acrylic to fit the size and curves of the table. I sanded the edges of the acrylic to make it round. That way all the edges are smooth and soft to the touch. Acrylic takes a long time to sand smooth as well as clear the edges. You can use a flame after sanding to make the edges a clear color. Since the whole creation of this table was straight out of the depths of my mind I have to do some experimenting to figure out how to get everything exactly how I envision it. I’ll add some pictures once I get done with this step. 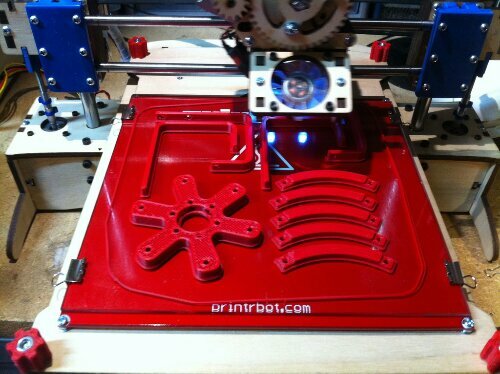 Tech Tuesday – Will Makerbot Sell Out? That’s the correct answer if you don’t have any hard facts. But! That hasn’t stopped me from speculating.See, MakerBot, the 3D printing start-up first to achieve success and fame, is reported to have been in the midst of meetings to secure $300 million in venture capital when the topic of acquisition was brought up, according to The Wall Street Journal – at which point, the VC meetings were put on hold. And, since this rumor was released by the journal, it’s hard not to wonder who put the offer to purchase the firm on the table. According to WSJ, MakerBot earned $10 million in revenue last year and projects a revenue of $50 million or more this year. With numbers like that, who wouldn’t want a piece of the action? So, let’s get this rumour mill kicking!Who could it be?Well, there’s Amazon, for one, whose CEO Jeff Bezos has already raised $10 million for MakerBot in its last round of investment seeking. The behemoth could definitely benefit from a method of product delivery that has customers receiving their orders in an hour instead of a day, as Steve Symington from The Motley Fool explained in a post back in February, 2013. This could be why Bezos admitted no fear of additive manufacturing. There’s also Autodesk, who recently partnered with the firm in a deal to release bundles of 123D software memberships with discounted Replicators. 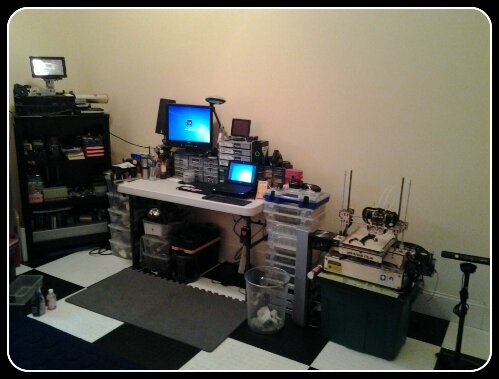 The CAD company might do well for itself to own some hardware to go with their software. And, then, there are the obvious, large 3D printing contenders like Stratasys, 3D Systems, and ExOne. Symington suggested a few reasons for why 3D Systems might be interested in the firm. 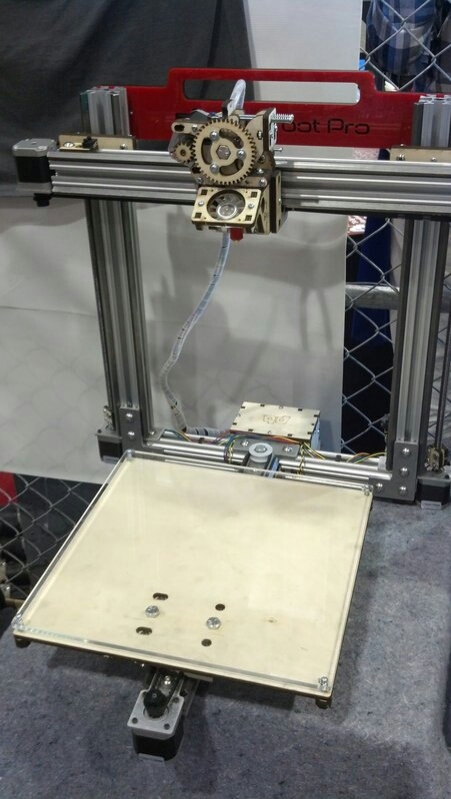 3D Systems, with its own home printing option, the Cube, could pursue MakerBot to weed out the competition and add the Replicator to their desktop line. 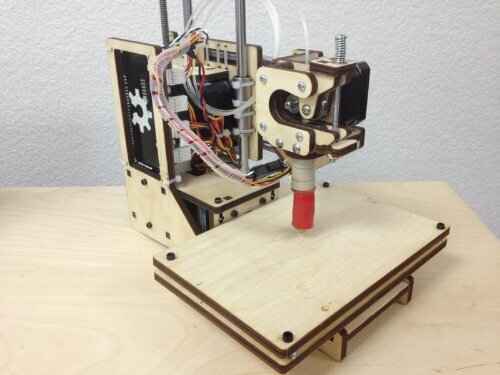 Could Stratasys or ExOne move into the home printing market? ExOne CEO, David Burns, was adamant that the company’s major focus was industrial printing in an interview with 3DPI, and this one does seem unlikely. But Stratasys, on the other hand, had its short-lived fling with HP from 2010 to 2012, to create a line of home 3D printers carrying the HP label, when the relationship was curtailed suddenly. They have also hinted recently that their long term strategy does include looking at the consumer market. Perhaps the older 3D printer giant has an interest in courting the young belle of the ball, hoping for a fruitful, if not controversial, intergenerational marriage. 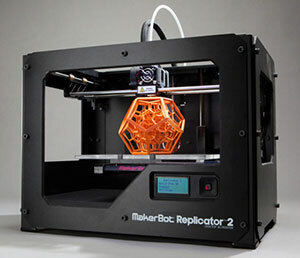 Plus, the synergy in the 3D printing processes could see added value incorporated into the Makerbot brand! 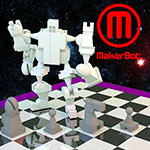 ?For a range of opinions from MakerBot users themselves, turn to the MakerBot Operators Google Group. One user speculates the possibility of 3D Systems acquiring the firm: “3D Systems just issued $250 million in new shares a few weeks ago, which is counter to what most of the market is doing so that’s probably a pretty good guess. 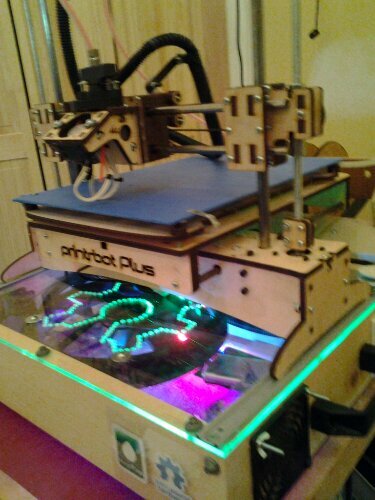 I hope that whoever it is keeps Thingiverse intact.”Another user responds that he’d abandon MakerBot completely if bought by DDD:3DSystems are the enemy. 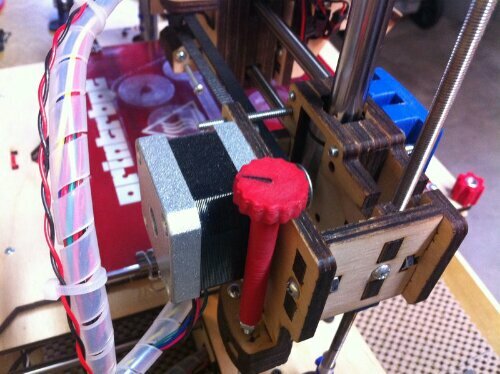 Not just an enemy of MakerBot but an enemy of innovation. They have invented nothing but a way to make money and a draconian filament control system. They don’t invent. They buy or steal and add it to their collective.Stratasys invented the fused filament process we all use and even today are innovating new ways to rapid prototype. I would much rather see them buy MakerBot and start offering home 3D printers than 3D Systems who already have a home 3D printer line and who would only be buying MakerBot to dismantle the competition.This is a hard line I’m drawing here and in light of the possibility of this sell out I’m not happy to make it. The WSJ article makes the prediction that Bre Pettis, CEO of MakerBot, won’t be selling any time soon. With the company moving its operation to a larger venue, 50,000 square feet, in the Sunset Park district of Brooklyn and expanding its team by 50+ members, it would be difficult to imagine MakerBot just giving that all up so quickly.I, for one, agree with this last estimation, believing, naively, that the days of acquisitions and monopolies are coming to an end. Sure, we’ll see old folks from the last generation hanging onto dead business models, but Bre is a Maker, grown up from the DIY community. Doesn’t he know the old systems of exchange are dying? If he is true to his roots, I am predicting more partnerships and friendly competition, instead of mergers and hostile takeovers. 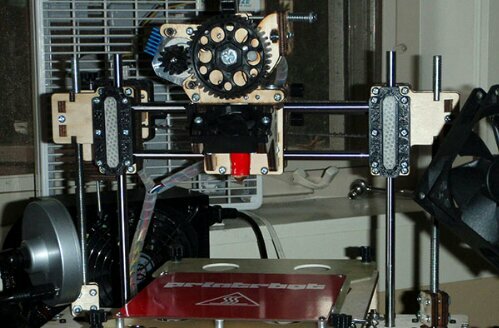 UPDATE: My sources say that Makerbot just teamed up with Stratasys as of June 20th 2013. So the rumers are true. 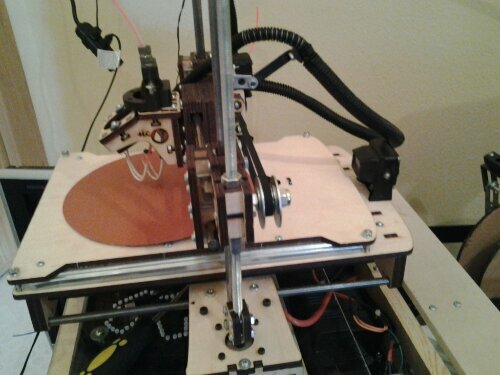 I recently found some Printrbot V2 mods that happen to be for the LC Plus model but you should have no problems with the standard V2 LC model as these parts will work for both. 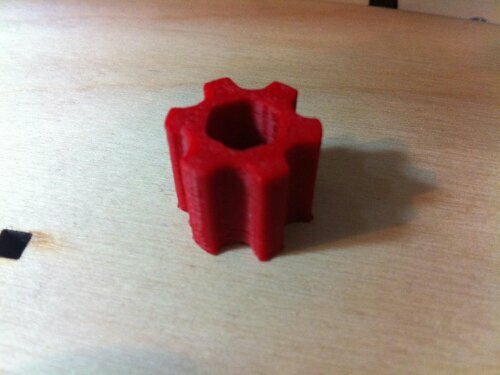 One of the issues I noticed when I was putting together my V2 Plus was the Z axis nut notch. It didnt hold the nut well and left it to rotate partially. I found a solution to that issue. 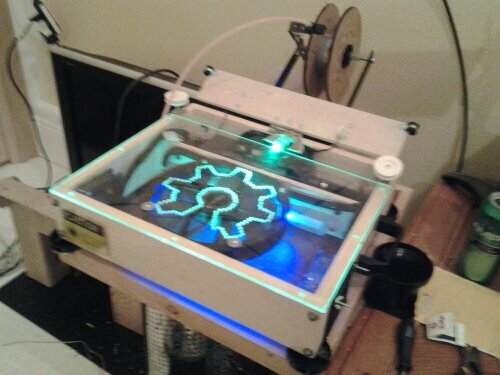 All of these mods can be found at Thingiverse. 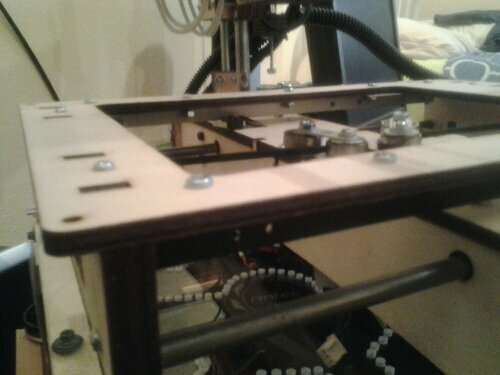 The spring in between the Z axis guide nuts also helps eliminate backlash and is something that has worked well for me in the past as well as currently. The wings on this setup ride within the nut trap and work very effeciantly. As of June 10th I found some similar printable mods. These one are a variation but they may suit your needs better depending on what they are. 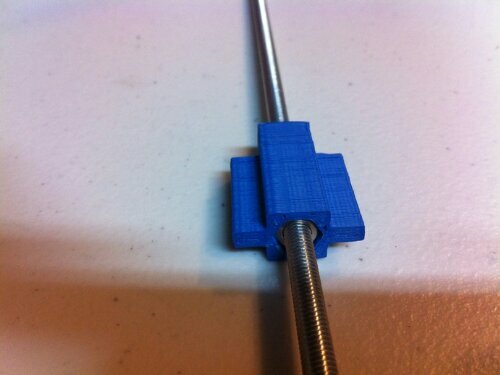 This mod moves the rod to more center and is suppose to be a better alignment. It can also be adapted to accomidate ACME rods. 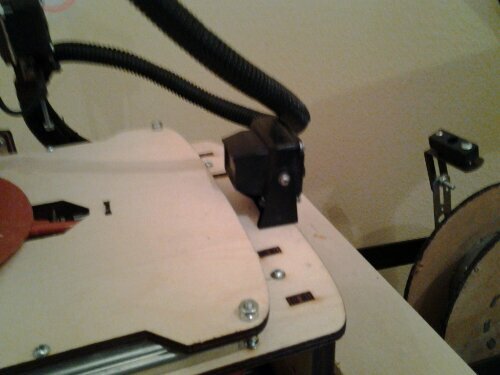 Another issue I noticed with the new V2 was the X axis smooth rod mounts. 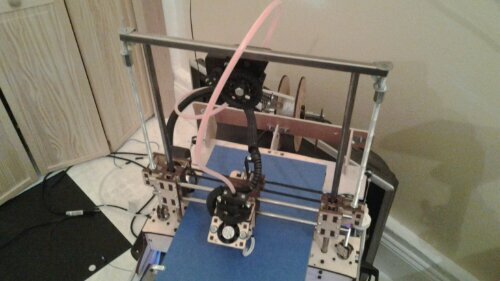 The stock mount didnt work well to make the rods parallel. 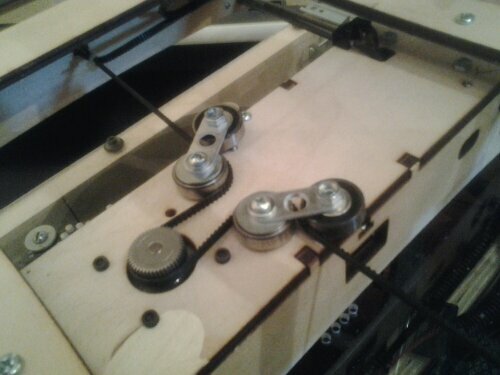 It also did not hold the rods very efficiantly and allowed them to slip a bit when the X axis belt was being tightend. Another fix I found by the same designer was to print a replacement that solved both of these issues very well. 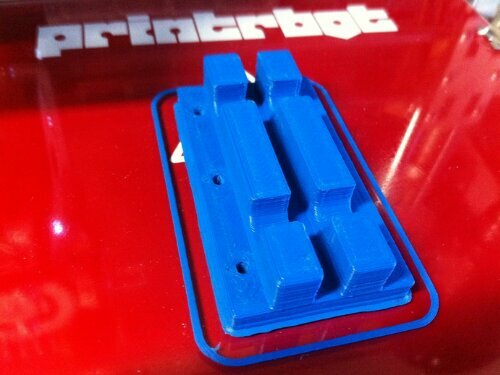 Another neat part about printing these x axis mounts is the fact that you can print them in any color you want. This gives your bot a little bit of much needed color. 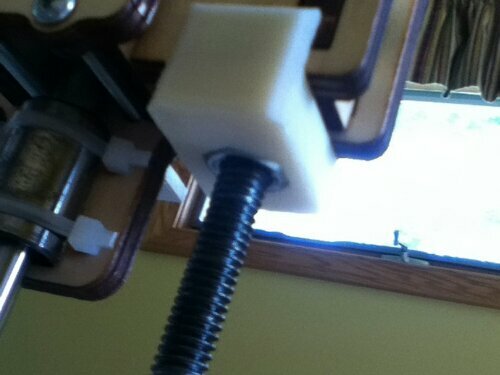 Here’s a very well executed x axis rod mount that I found on Printrbot Talks forum’s. 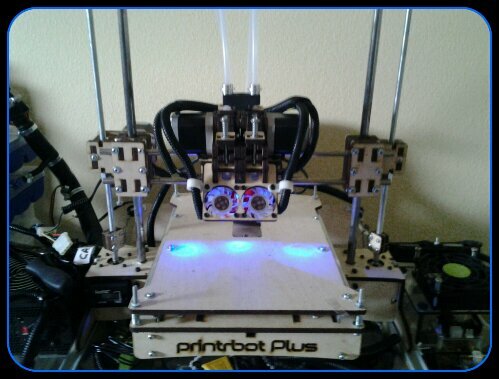 I will definitely be adding these to my Printrbot plus V2 but, instead of regular LEDs I will add a green, red and orange LEDs to use as status lights. 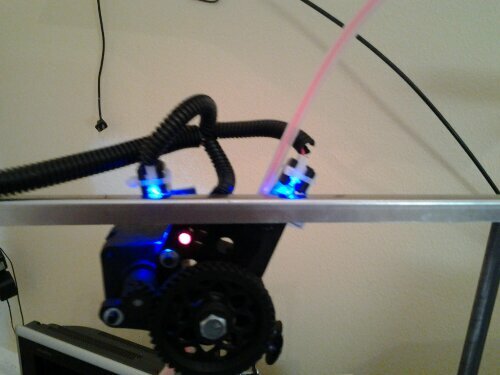 The little clear PLA face plate is a diffuser for a blue power on LED I’m going to place in each one. 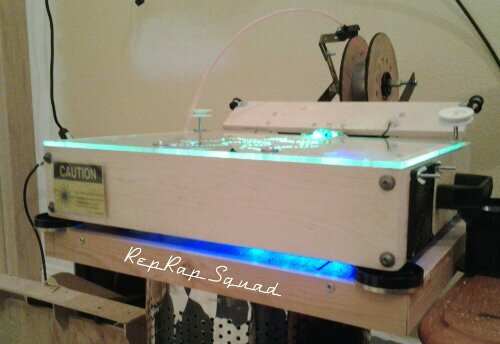 If you don’t want an LED, you can add color to the design by printing the plate a different non transparent color, or if you’re a monochrome person,. 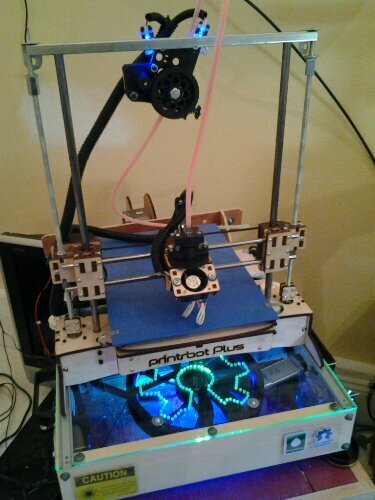 Print both parts the same color. 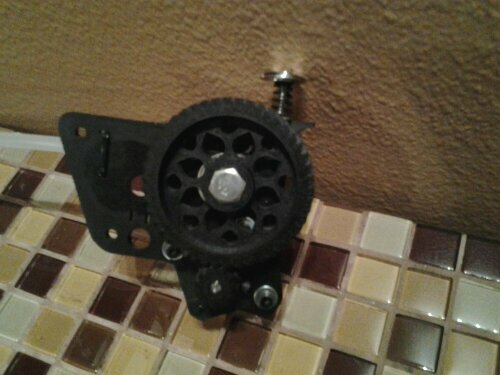 They press fit into the fixture. If you do go with the LED idea, print the diffuser 1 wall in all directions with honeycomb and the honey comb will show through with the light. The actual X Rod Blocks should be 2 walls in all directions ~30% infill. 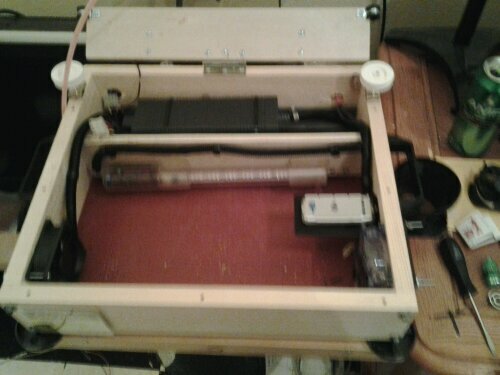 Here you can see the x axis covers installed as well as the Z axis retainers. 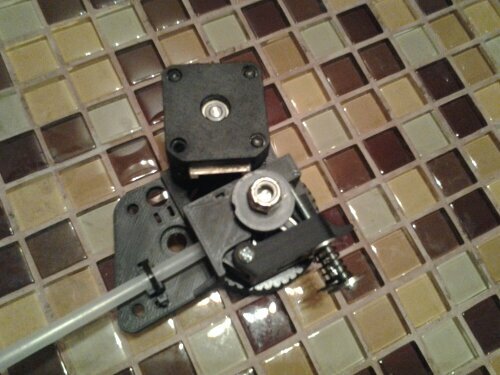 I had a lot of problems with the nuts on my bed leveler system working there way out during operation. 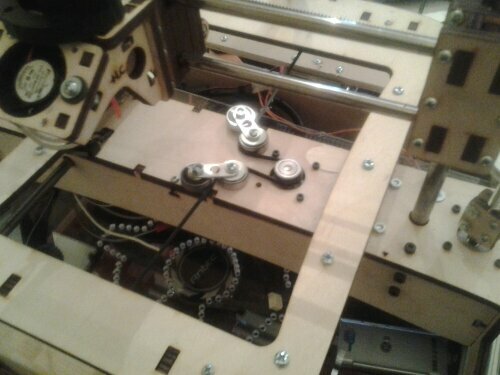 I found a way to solve that issue by printing out a set of leveler knobs that not only keep it in place but allow for easy and quick adjustments before operation. 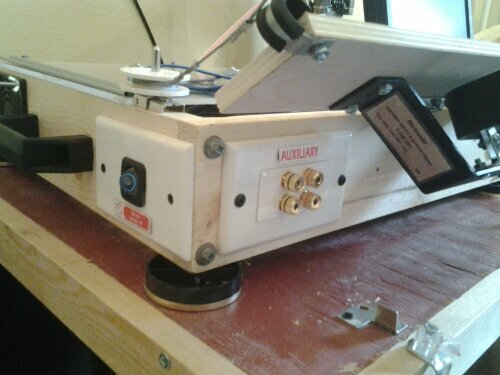 A mod that helped to keep filiment going into the extruder was a guidler that is designed to fit on the stock Printrbot extruder. 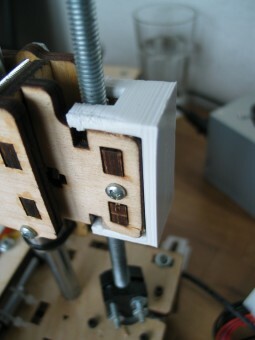 There is also a printable spring holder for the extruder that makes for easy adjustments. 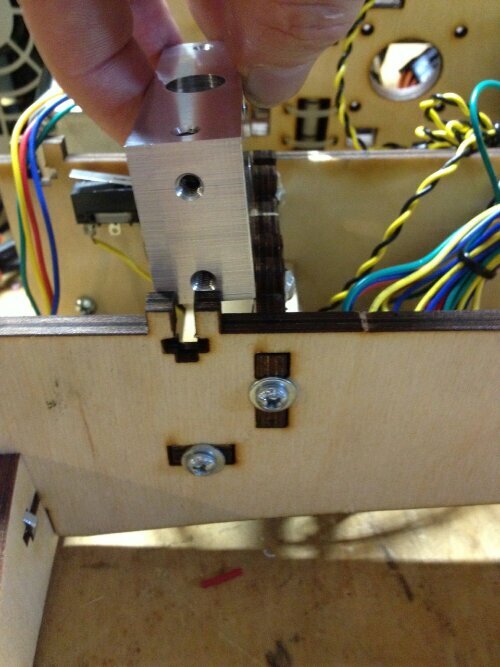 The combination of the two make for simple extruder adjustments and a more reliable extruder operation. 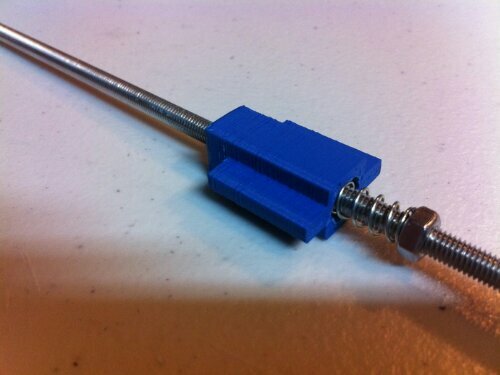 A printable z axis adjustment knob is a good idea if you dont like using a screw driver for simple adjustments. It has a knob to make for quick adjustments. It is however not as accurate as using a set of calipers for vertical clearance. You can use a perminate marker to put a line for referance. 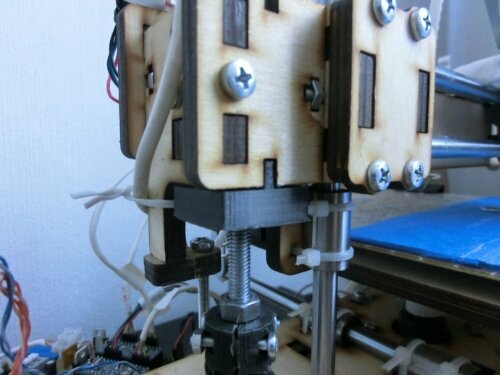 A mod that i have personally built is a Z axis stabilizer. 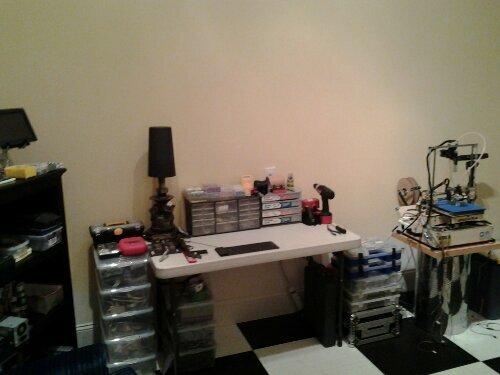 I also needed a location to mount my bowden setup that will eventually be a dual bowden setup. I used 2 L shaped strips of aluminum that i bolted together. 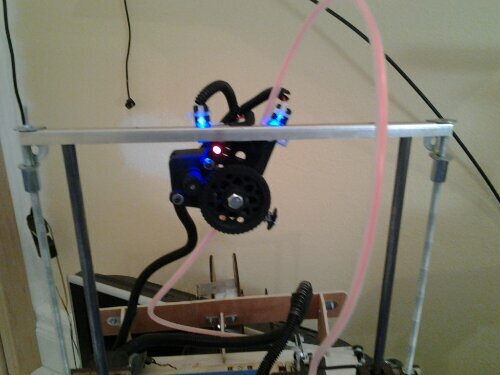 These use pressure to firmly mount to the Z axis smooth rods and work very well for stabilization as well as bowden mounts. 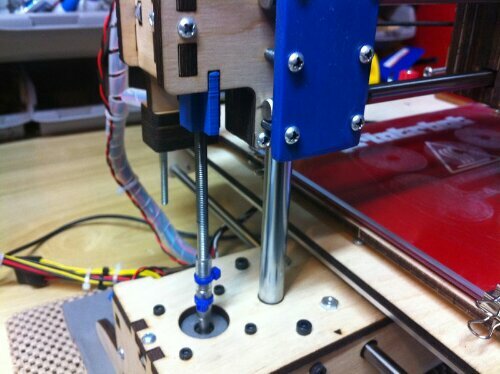 This location also puts the least amount of bowden tube pull or push on the extruder. 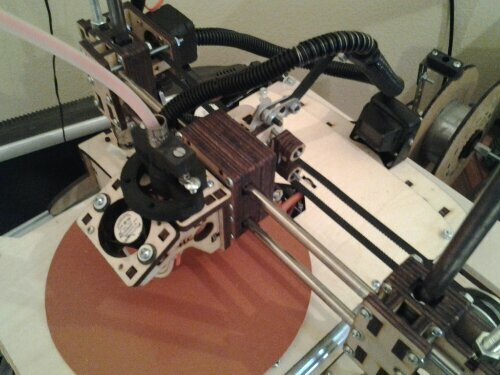 I have heard about issues with the wood bed warping and after recieving my pb plus I noticed it as well. 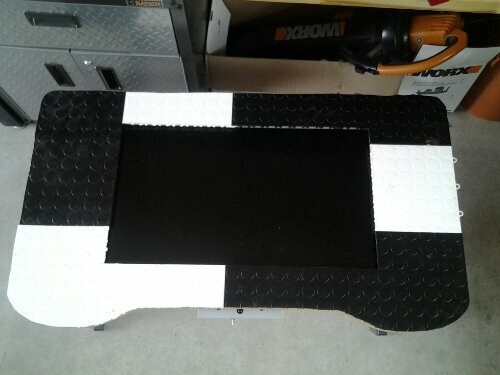 So one of the 1st things I did was to get the bed and sub structure mount for the bed as flat as possible. 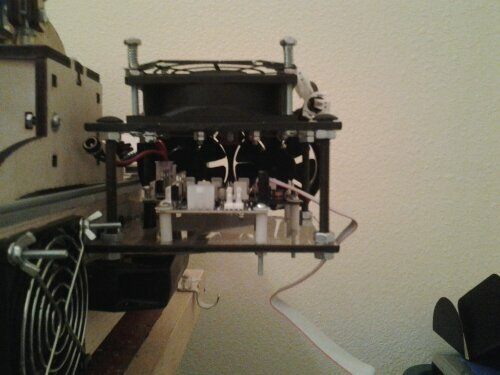 Then I mounted one “L” channeled piece of aluminum on each side from the front to the back. 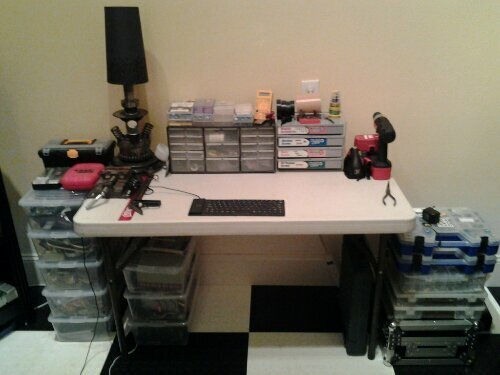 I drilled holes about every 3 inches to make sure it would keep everything as level as possible. I also chose to use fairly heavy duty nuts and bolts. 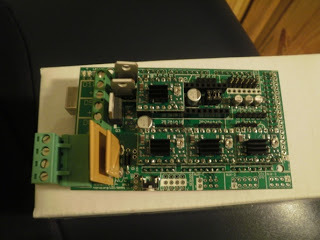 On the main bed piece I used half boxed stamped metal which added a large amount of regidity. 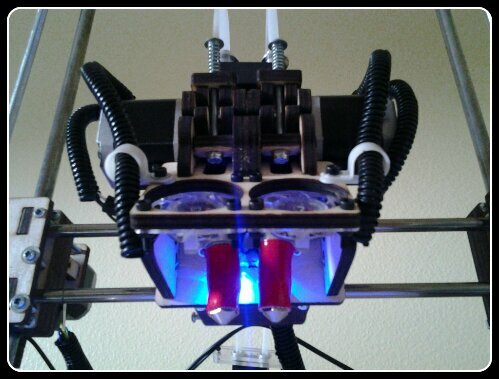 It is low enouph profile to only take up a small amount of my Z axis print height and high enouph to add some serious strength. I fastend it with the same kind of bolts and mount distance. 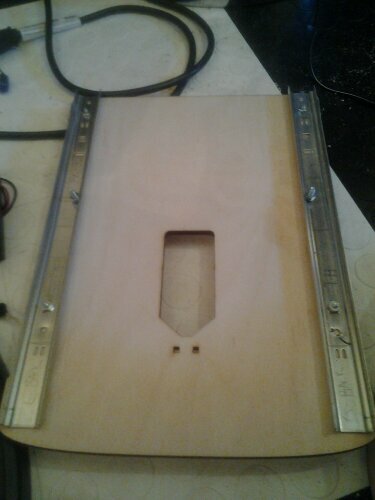 I had to notch out the 4 corners of this mount to accomidate for the bed leveler mounts and springs, which turned out to be easy with a bench mounted grinder. These modifications will make it a lot easier to keep the bed even and level. 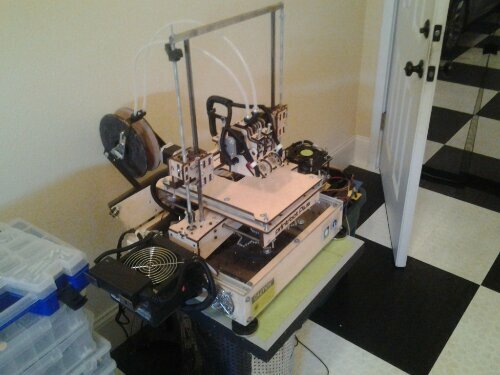 Which should lesson the amount of re-leveling needed before prints. Being aluminum the added weight is minimal at best and should not effect bed movement. 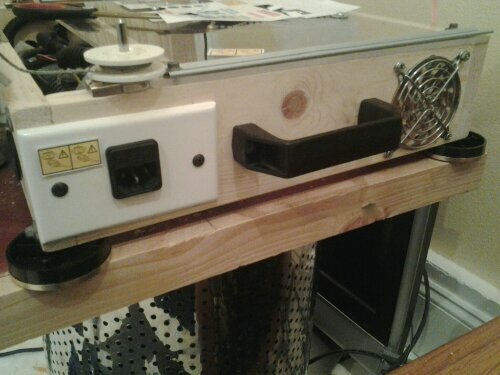 I also took the time since I had the bed off to put on aluminum belt guides with ABEC 5 bearings that act as a tensioner on the Y axis. 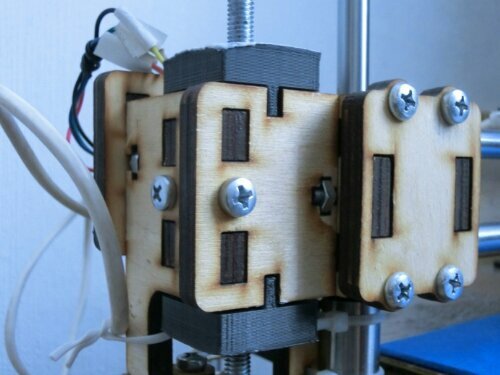 These will help keep the belt from wondering as well as keep the belt tight for better print quality. The tensioner system can be easily adjusted in any position within 360 degrees. 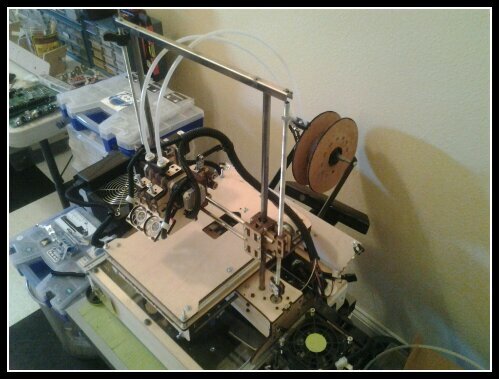 Ive found that this is a lot smoother movement even over using the stock PB idlers with fenders. Eventually i will add lower fenders on the idlers as well as the tensioners to keep the belt from going too low, which hasnt been an issue so far. 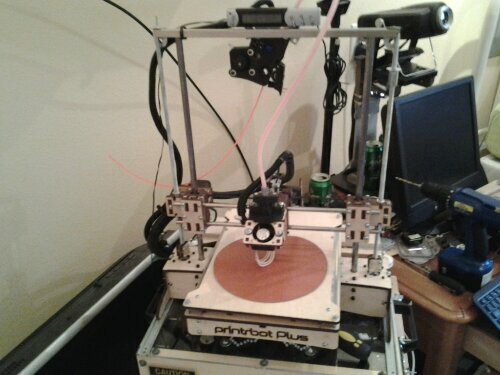 Recently there has been a photo leaked on Twitter showing a rather interesting Printrbot Pro. It would be merely speculation to say wether or not it will go into full production later this year. It looks rugged using extruded aluminum for the main structure. It also offers a handle and might possible be able to fold up for more portability, (similar to the Foldarap.) 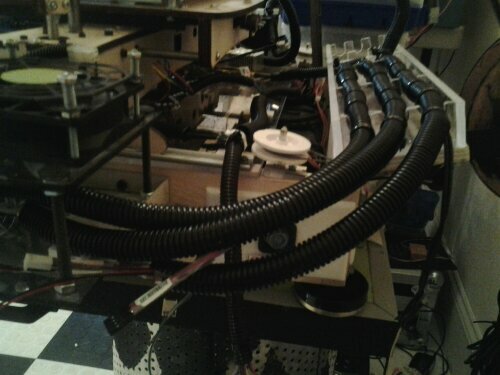 It still uses some LC parts as do the the production models currently available. We can all hope and dream that this product will eventually come to market at an affordable price. 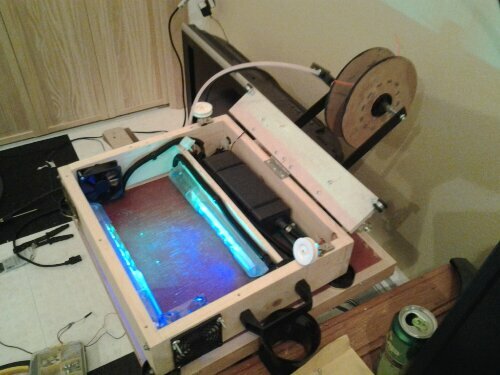 It would make since that Printrbot would fill out there line up with a pro version that could offer top of the line belts, aluminum GT2 pullys and maybe one of their recently released 1.75mm direct drive extruders. I must say that personally this would be a good move especially if it could be had as several different kits at an affordable price. 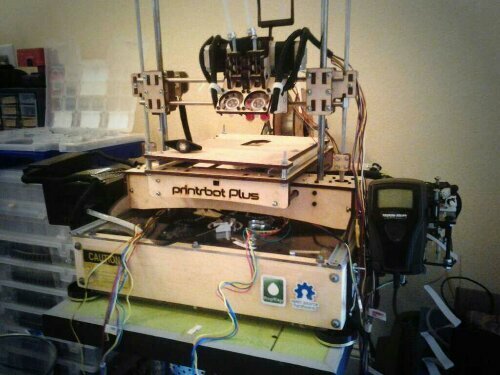 The anticipated Printrbot Simple Beta has had a few changes as of today. 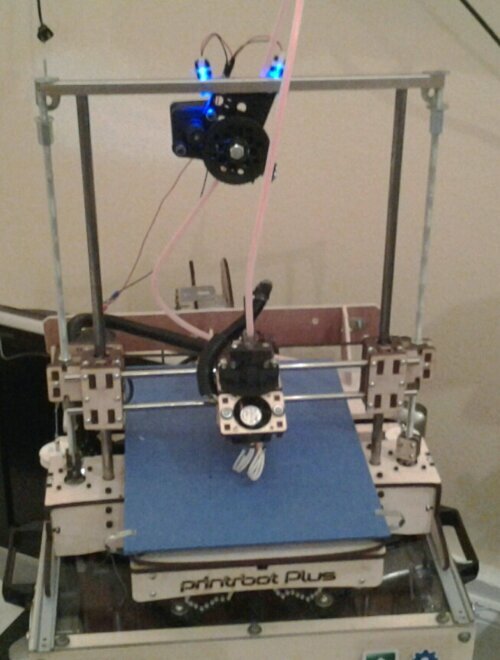 This new picture was posted on Printrbots Twitter account today showing off a direct drive bowden setup which will be their first. 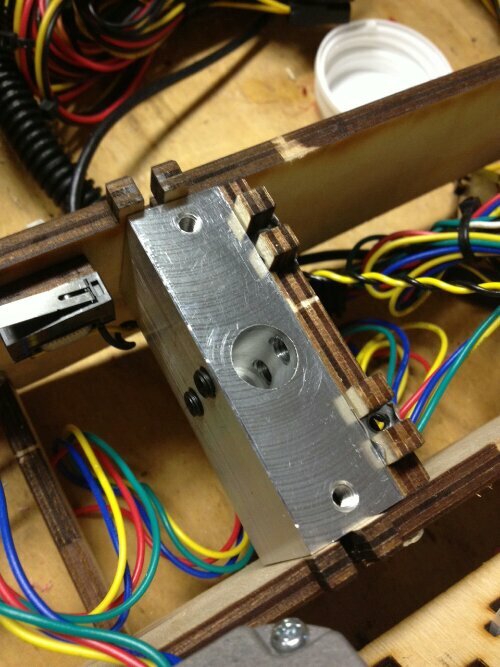 They are running a 1.75mm hotend with a laser cut wood extruder. 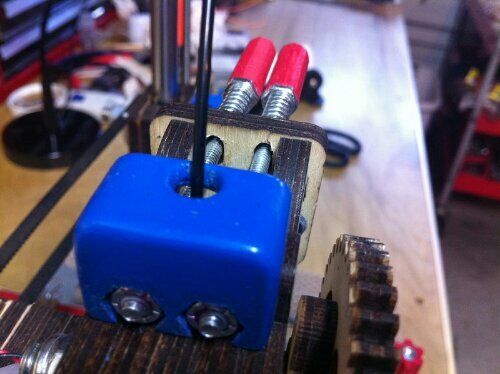 Another add on they changed was the addition of a Acme rod for the Z axis which has never been done before by PB. The Simple looks like it will have a 100mm squared print volume in the final version along with the add ons I’ve mentioned. 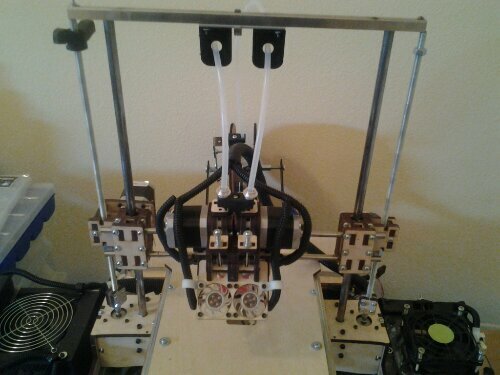 Another change over the Beta release is a lot stronger base and a few movements of parts to reduce wobble and any drooping problems that they have had with beta release. 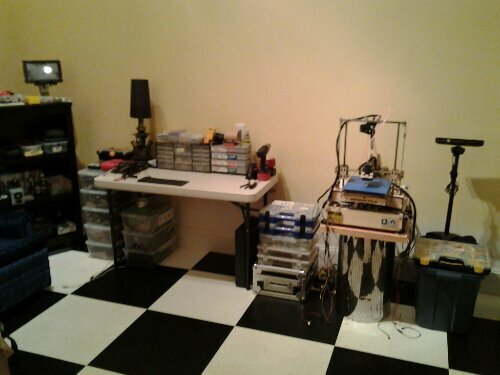 It sounds like Printrbot may offer for an additional fee some upgrade packages. 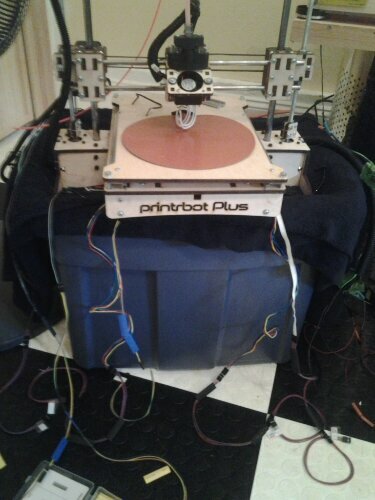 As it is the Printrbot Simple steps into the boxing ring at a very affordable price that can only be had by a company buying a lot of parts in bulk. Otherwise they would be lucky to break even at the low price of the PB Simple. 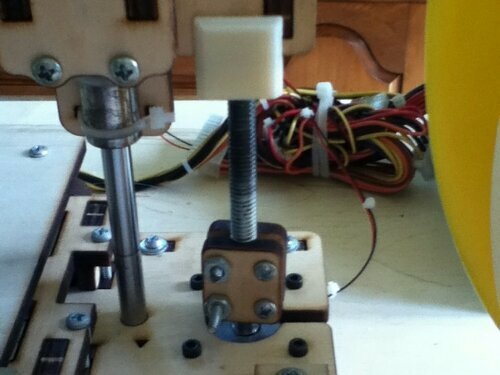 Check back for more updates as they come out on the Printrbot Simple. 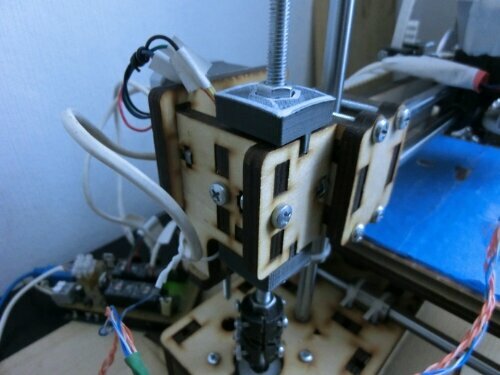 Recently on the forums we were trying to solve an issue of the new Z-axis aluminum blocks fitting on the V1 version. 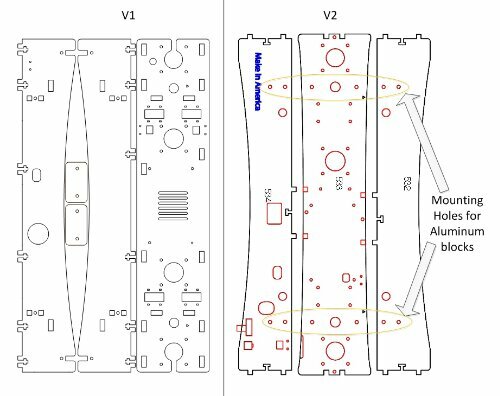 After a review of the files side by side it became obvious that the aluminum Z blocks didn’t have correct mounting holes. This typically could be solved by drilling out holes to mount. 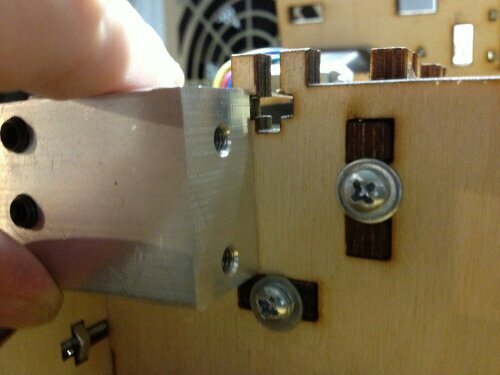 The issue with that is the mounting holes on the V1 base are in the way of some of these holes. A solution that I came up with is to buy the same thickness and type of wood used on the original. That way you could use the original base pieces as a template. 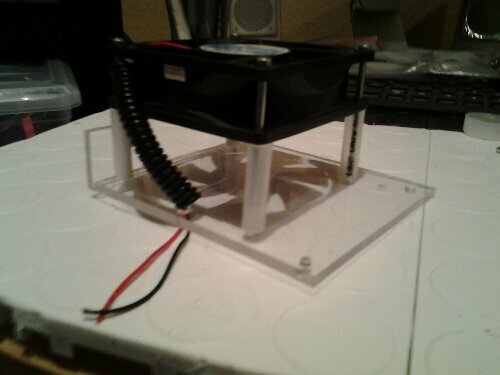 Then modify those designs to fit the V2 aluminum block mounts. Some of the pieces that holes the side pieces to the top will have to be relocated. 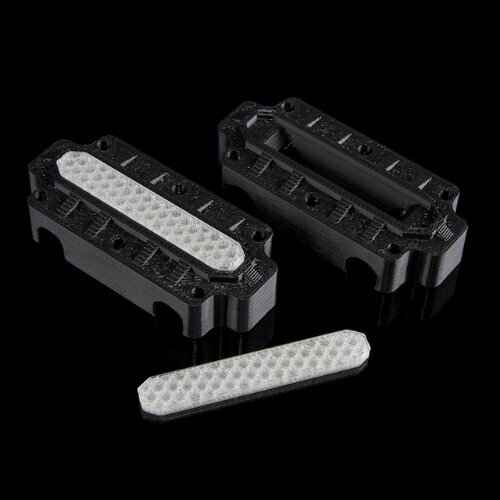 You can used the design files of the V2 to make these adaptions as well as determine block mounting locations. 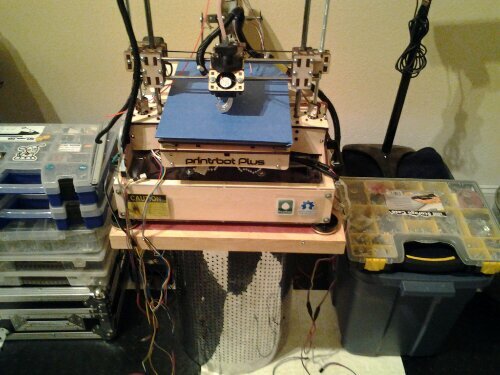 All you have to do is print out the v2 base design in full scale and lay it out on top of the new cut out design. 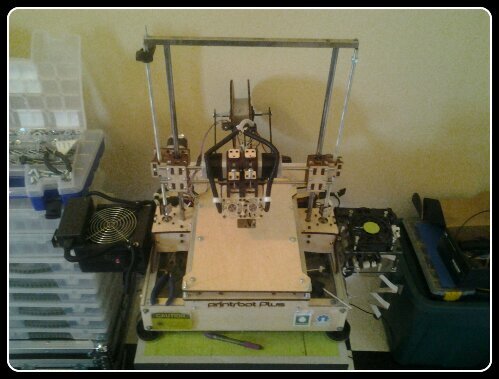 I refer to this version of the design as Printrbot 1.5. It would be interesting to see how this all plays out. I will update this post as solutions are implemented.